WHAT: MAKIN IT HAPPEN is a triathlon in memory of Marlene Antoniuk who battled lymphoma cancer from 2004 until October 2010. She volunteered annually at the Just - Tri - It triathlon race which was formed to introduce women to the sport. Her big smile and contagious laugh along with her strength & determination will always be remembered. The year following Marlene's passing, the JTI Team decided to pass the race portion of their program over to Marlene's family. They proudly accepted the offer and held their first annual race on Mother's Day in 2011. Today Marlene's family continue organizing this race in her memory. The participant registration fees, company sponsorship and race day volunteers are what allow this race to continue. Our triathlon is an un-timed race designed for two groups of people; the first time triathletes as well as the experienced. The beginners want to feel the experience of a triathlon race and the experienced want a soft kick-start to their training schedule. Over half of our beginner participants carry on to compete in several triathlons through out the year, and most continue to keep fitness as a top priority in their lives. So whether it's your first race ever or just the first race of the year we welcome you all, men included! 11:30am - Pack up and enjoy the rest of the beautiful day !!! Click here to see last year’s Global TV clip. Thanks in advance for your time and consideration, much appreciated! Makin' It Happen triathlon is held in memory of a woman who lost her battle with cancer and had a passion to introduce women to the sport. On Sunday morning, 130 participants swam, biked, and ran their way to the finish line for the annual Makin’ It Happen triathlon, which is held annually on Mother’s Day. For Steph Hall, crossing this finish line also crossed off a goal she set earlier this year. “I’m turning 40 this year and I wanted to do something at the beginning of the year to sign up to do something that was physically challenging, but also mentally challenging,” said Hall. The mother of two said completing her first triathlon was an amazing feeling. 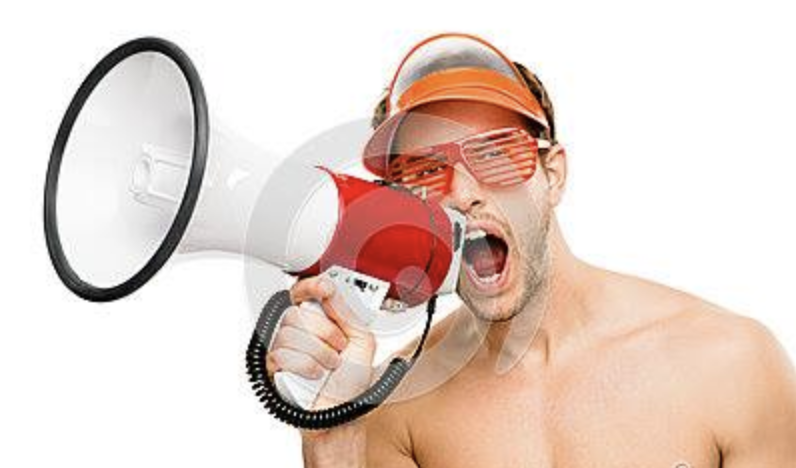 “This race is geared towards beginners, absolutely. It’s an unintimidating environment for people to come out when they’ve never done a race before,” said Tammy Fleming, one of the organizers of the Makin’ It Happen event. For Dana Kripiki, that couldn’t be any more true. Only 26 sleeps left until our 8th annual race and we're still in need of volunteer support. Please email makinithappenformarlene@gmail.com if you can help out and check out our previous blog on volunteering HERE. 11:30 - Pack up and enjoy the rest of the beautiful day !!! 1. Go short before going long. Begin with a shorter race. 2. Stay close to home. For the first race, make it easy on yourself and select an event close to home. If the event is within easy driving distance from your house, it helps reduce race-day stress and hassle. You can also do some of your workouts on the course, increasing your confidence. 3. Just a swim suit and goggles for the swim. A good pair of goggles and a swim suit made for lap swimming, not sunbathing, is all you need for the swim portion of the event. 6. It doesn't take as much training as you might think. You are not training for a podium position at an Ironman event for your first race, therefore you do not need to be training 20 to 30 hours per week. You can be ready for a sprint-distance race on less than five hours per week of training. Most weeks are less than five hours. You can find detailed training plans here or check out Saskatoon Just-Tri-it training program which includes your registration fee for our race. 7. Plan to rest. For most eager racers, it is easy to plan to swim, bike and run. Be certain you plan to rest as well. You want to do enough training to complete the event and have fun. It is best if you finish the event with a smile. 8. Transition time counts too. I have had some beginner triathletes write to tell me they were surprised that the time it takes to change from swimming to cycling and from cycling to running (known as transitions). Thankfully our race is un-timed allowing you to prepare for ones that are. 9. Plan to do the first half of the race slower. Most beginners start too fast. Since our race is un-timed you can choose to use a kick board in the pool and alternate walking and running. 10. One piece of "trick" equipment. If you want to pick up one piece of "trick" equipment, purchase elastic shoe laces. Elastic laces allow you to slip your feet into your running shoes and eliminate the need to tie your shoes. 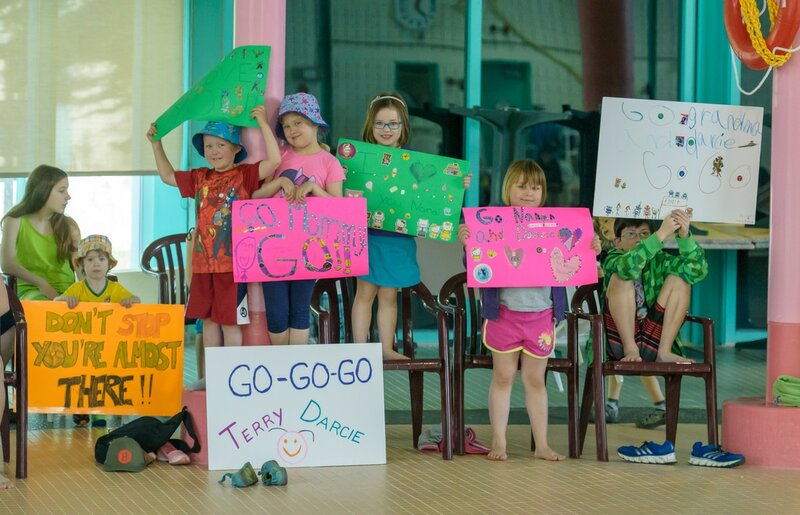 Photo of kids cheering their loved ones on at Makin' it Happen 2016, Courtesy of Steve Hiscock. ​Article courtesy of: Gale Bernhardt was the 2003 USA Triathlon Pan American Games and 2004 USA Triathlon Olympic coach for both the men's and women's teams. Her first Olympic experience was as a personal cycling coach at the 2000 Sydney Olympic Games. Thousands of athletes have had successful training and racing experiences using Gale's pre-built, easy-to-follow training plans. For more information, click here. Let Gale and Active Trainer help you succeed. Our triathlon could not be possible without the generous donation of time from our volunteers year after year. Did you know that a large percentage of our volunteers go on to become participants themselves in the following year/s? And many of our volunteers have been with us from our first race on Mother's Day in 2011! Volunteering is an excellent way to truly experience something, and it gives you an opportunity to get involved in your community. By volunteering at our Makin' It Happen race, you're making it possible for someone to reach their goal that for some, never thought possible. And who knows - maybe next year that someone will be you! If you have any questions and/or are available to help out, please email makinithappenformarlene@gmail.com or find us on facebook at "Makin It Happen for Marlene" and send us a message. Thank you for your consideration and time, and a huge thanks to everyone who's volunteered in the past and to those who keep coming out for more! Without our volunteers, there'd be no race. MAKIN IT HAPPEN is a triathlon in memory of Marlene Antoniuk who battled lymphoma cancer from 2004 until October 2010. She volunteered annually at the Just - Tri - It triathlon race which was formed to introduce women to the sport. Her big smile and contagious laugh along with her strength & determination will always be remembered. Register today and Make it Happen in 2017!! It's official! Race day in 2017 will be held the morning of Mother's Day; Sunday, May 14th. 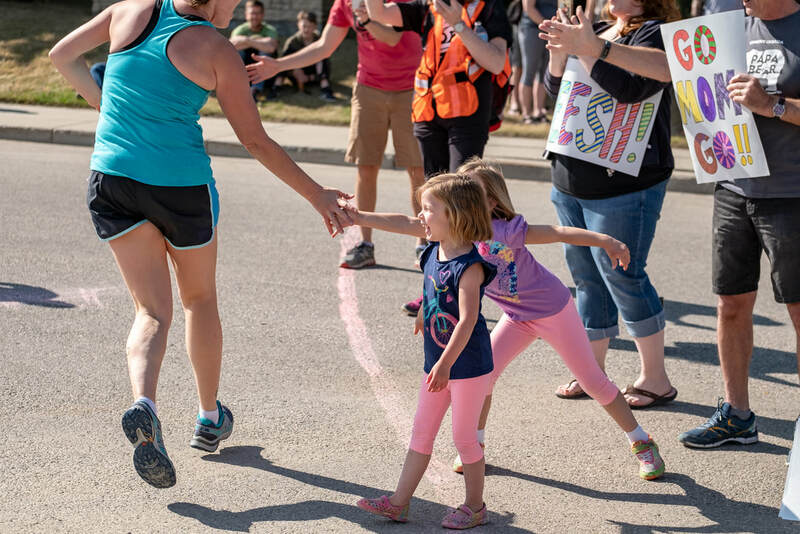 What an amazing gift of training with your Mom, Daughter, Son, or Grandmother, to then cross the finish line on race day hand-in-hand! Well this year you can make that happen! Start your Mother's Day morning out with us and cross a triathlon off your bucket list, or let our race be the first of your first season. Our un-timed race allows you to gain experience into what a triathlon race is about without the pressures of a timer. And for the experienced, it kicks off your year of races. Come one, come all - we welcome everyone of all levels, men included! For last yea's Global TV coverage click on HERE. Happy Training! Nicolene Watson, Marlene Antoniuk's youngest daughter. Nicolene is our Web Designer, Blogger, Social Media Manager, Race Day Volunteer Supporter and Participant Cheer Leader.